Hey everyone. I'm sitting back looking at all the post and found this one most interesting to me and looks like its interesting to some others. There is nothing I like to do more than sit about 25ft up a tree with Bow, Muzzle Loader, or Rifle. I do start in September and do not stop until January, end of Deer season, that what I do, it's my passion. I do go to Church, I do believe in God, that's not the topic today. Sunday hunting should be a choice we all should be able to make. I find it very hard to understand for the reasoning why we can't gun hunt on Sundays. My findings are that the Deer here in the South are adapted to the hunter, they figure us out. This time of year in most cases they get very nocturnal very hard to hunt. Sunday hunting with gun would make that 30yrd shot with Bow more like 130yrd shot with gun especially the hard to hunt deer. I do believe if we stand all together on this issue it will happen in the near future. For me if it happens, I will still go to Church Sunday morning and will stay closer to God the rest of the afternoon and evening about 25ft up a tree. That's just my feeling on the topic. Hope all has had a good season. God Bless. Good morning to you all. I do not mess with Facebook or know anything about YouTube, so it does not look like I will post any video's. I do thank you for letting me know how it is done. I will just share some pic's, that's good enough for me. Tell you all the truth it took me since 2004 just to post to the NC Sportsman. I'm just one of the guy's that sit back and look at and read your posts. I do take some of your knowledge that you all share and apply to some of my hunts. I'm far from a expert on whitetail hunting, but I can assure you all I put my heart and sole into the hunt. I can tell you that I like to hunt the old fashion way. I like very much to scout, find where the deer are moving, find the big rubs and scrapes, put a plan together and hunt. I have never used a camera until I moved to NC. I have never feed deer anything, always hunted food source. The camera's, the feeding, get me all screwed up. We can all count our chickens before they are hatched, meaning that now we seen him on camera it will be easy, that is Bull Crap. I had a nice one on camera last year, had him on the wall opening day, NOT. I hunted almost every day, at least every chance I had, that deer went nocturnal, he would not come near food or camera in daylight. 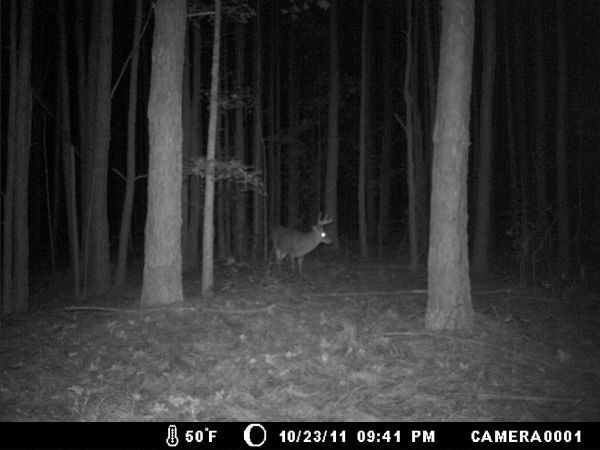 Well,I will share with you, I moved away from camera , deeper in woods, I called it my staging area or should I say his. On November 28th 3:00pm, on a real crappy day, raining very hard, wondering why I was up in tree and not down in ground blind, he showed up. By the way that was the first deer I shot, I missed my opportunity prior, my own fault. That is just a example on the rewards that I get out of hunting. The feeling when you get down out of climber, look at that deer on the ground, it's overwhelming sometimes, brings tears to me eyes. Yup, a 54 year old guy being that thankful, that blessed, that he tears up, man I love that feeling. Tell you guy's it gives me goose bumps talking about it. If you never had that feeling, I pray you do. I believe that some of this chatter and hype can get us off track. I think our ego's gets involved, I have seen my own for sure. Focus on why do we go to so many extremes to hunt, thank God we can. Thank God for every day you get out there whether you squeeze that trigger or not, just hunt like you mean it. God Bless. I have tried to post video's without and luck. Can anyone give me any suggestions? The time is near. Some of the big boys are getting a little frisky. They also are only showing there heads at night. The only good thing is, that when in a tree stand I have been seeing a bunch of doe's, you all know what happens soon. I have been trying to put one on the wall with the Barnett Crossbow, Quad AVI 400 awesome bow, I guess just to say that I did. I have been seeing a bunch of big rubs, these are the biggest I have seen here in NC since I moved here in 2004. Also a bunch of very large scrapes, bigger that usual. I'm starting not to sleep well and neck is getting fatter, must be the rut is very near. As you all can see I love to hunt, or should I say I livetohuntnc!!! My Wife thinks that I'm nuts, she could be right. By the way they are falling from the oaks fairly well right now, that's where you probably will find me, 25ft up. Best of luck to you all. Thank you for the warm welcome. I'm new to this site, looks like some of the big boy's are starting to get on their feet. Looking forward to seeing more nice ones off their feet. Very nice, much congrats. Unless that buck has a twin he was on my hit list also. The only thing I can see with your picture is the brows are bigger on your buck, man he is nice. 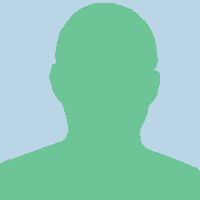 Can you give a hint of what part of Granville county he was killed? This will help me greatly. I will hunt the number two buck on my hit list. Again what a fine deer. The look on your face is priceless. Have a blessed day. My friend that is a great deer. You know, if only others would have the same values that you stated in your story, we would live in a much different world today. I totally believe in that statement 100%. The smile on your face is priceless. Anyone that follows His beliefs, the rewards are great. You never know just what will walk under your stand, that smile, the story, the words. I say this due to my values are 100% the same as our friend holding that awesome 8 point P&Y Whitetail. Congrats my friend, you have touched another heart with your story. Carrying God's message is what we do. God Bless you. (I try to do it all for the glory of God,â said Poole. âIf He gives me the platform where Iâm a hunter, it gives me the opportunity to tell people what God has done in my life.â) Very well said. Get back out there and get another. Very nice buck, congrats. How about the one in the back round, see it has some horns too. Very well done. I really like to see hunters let them grow. The feeling when the big boys get out in front of us is priceless, congrats my friend. That smile says it all! What county was the harvest? Have a blessed day. Hi ya all, that's my Yankee Southern talk. The big boys are getting ready to show off their stuff. I have seen this happening for the past 3 or 4 years now. This week that is approaching is when you need to be in the tree or blind, pack your lunch. I had Tuesday eve a real nice one come out in field, 5:15pm, safety off twice, could not be sure he would make the requirements for the wall, for sure he had my heart pumping. He was showing the girls that he was ready. This buck was checking each doe, pushing all his weight around. The doe's would pee, he would run up to the spot, about go crazy and check another. In the past 3 years, Thanksgiving week has been where they loose there wits. Also by the look of most of the roads they are not shy of walking out in front of cars either. The time is right, good luck to all, getchyaabigen. There I go again, northern chat, just can't help it. Good luck and God Bless. A comment titled: We all screw up. in response to a report titled: Strike 3!!! I might be OUT!!! Goofed up again!! Hey buddy, crap happens. Fixed blades, mechanical blades, whatever. I have seen a 12 gauge slug, and a 308 180 gr take them down hard, only to find that he was able to get up and run, never to be found. The most important part is that you put 110% in looking, the recovery, don't give up to early. Look at it this way, if he is dead, there are many critters that will dispose of him, even the mice will have a feast. Man, we all do it, for sure I can tell you I did. Kept me awake many nights. I find it amazing how the desire to get that big buck skews our ability to think straight more often than not. Concentrate on shot placement, squeeze softly, and pray for a quick recovery. Get in a tree and hunt, your next trophy is on its way. He is on the wall, he became a hard deer to hunt. He never figured I'd be there in pouring rain, hehe that's why they sell rain suits. Dropped the hammer on him, Rem 308 the rest is memories. A comment titled: No question, squeeze in response to a report titled: Whats your Opinion on this Guy???? Yes Sir buddy, I really get worked up on inside spread at 20' or over. He will make a nice mount. All I could suggest is do a mount that will show the stickers. I did a mount last year called Busted, turned out great. Good luck, keep us updated. A score is only a piece of paper, a trophy is in the eye of the hunter. A comment titled: Nice Deer. in response to a report titled: Well Look Who I Found!!! Well I'm going to comment on my option only. You all know that feeling when a nice buck gets in front of you, heart gets racing, eyes locked on that rack, just a overwhelming want. When a buck like that runs in on me or walks in, that's the feeling I get, that is why I hunt. That feeling of nothing but that buck is in my head. That uncontrollable heart beat, that desire to get my hands on his rack, no matter what score he adds up. I tell you, I get that same feeling when I shoot a nice doe, no deductions, score of zero. I pray that the feeling I'm talking about will never go away, that's why I hunt. I sometime sit in my trophy room, as my Wife calls it, and reminisce of the deer on the wall. I can remember every hunt, the feeling and the emotions after squeezing that trigger. I do not regret shooting any of them. My friend, I will say it like this, you have a very nice looking buck on that camera. If your a hunter like me, put him on the wall. You will have a ever lasting hunt that you can look at every day if you like. I have some 100's on the wall that made my heart jump, just like I stated above. Thank you for letting us see your buck, he is a very nice one. If I was ever lucky enough to have him in range, I would put him on the wall with the rest. God Bless. MaMa is not happy, either is the youngin. Yes the obsession is overwhelming. The only problem is I don't see it. Here is a couple more pic's of some others that have been visiting that area. The dates on camera are messed up but they are all this season. The one I'm really interested in, I have only seen him once on camera. The video is very dark, but he is a big one. Much bigger that these pic's, much wider and taller, very nice rack, at least a 10 just not sure. I do think I know where he is bedding, just not sure of that either. It is killing me to stay away but I don't want to bump him out, you all know what happens when they get seeing us to often. 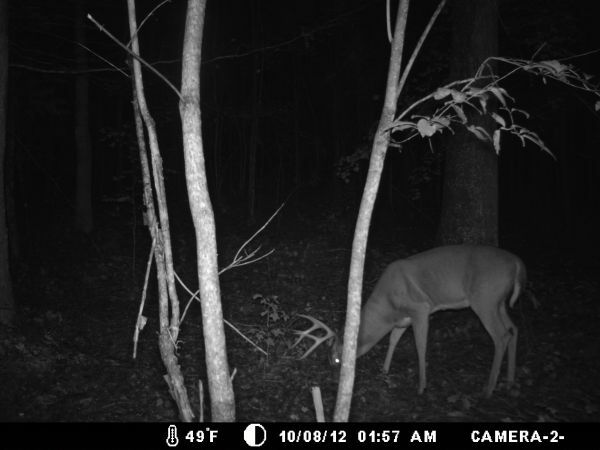 I think he is bedding about 200 yds away from where these pic's are taken. I will get in there early Muzzle loader season, yes opening day, then just hope for some luck. This buck has walked in on me 3 times 6:15am. He stays about a minute, then walks off. I can make out it is him, just on body size, very big body. Looks like the weekend is best for deer activity, Sunday and Monday look really promising. Have a good day. Thanks for the welcome. I look forward to posting some pic's this year along with some of the older previous years. Take care, have a great day, I'm heading to the woods. livetohuntnc has not filled this section yet.